You may see Sharp-shinned Hawks flying swiftly through the woods in our area. Referred to as "sharpies," they are the smallest hawks in North America. The kestrel, or sparrow hawk, is smaller, but the name is misleading because it's actually a falcon. Our Nature Guide Jon Latimer tells us about sharpies and how to identify them. "A Sharp-shinned Hawk (Accipiter striatus) is about the size of a pigeon you might see on a city street. Its wings are short and rounded and its long tail has a square tip. An adult's back and wings are blue-gray, and its chest is marked by reddish bars. Females can be nearly twice the weight of a male and are browner on their back. The tail of both sexes has black and gray bands. Sharp-shinned refers to the exposed lower portion (or shin) on this bird's long legs. "Sharpies are generally found in or near thick stands of trees, especially oaks. They specialize in hunting small songbirds such as sparrows and robins. Sharpies are agile fliers, able to pursue their prey through dense vegetation. They may use trees or even man-made structures to conceal their stealthy approach, then capture their prey after a short chase. They have also adapted to human habits and are often regular visitors at bird feeders, looking for birds not seed. "Sharpies can be seen throughout the day, often close to the treetops in the morning and soaring higher later on. 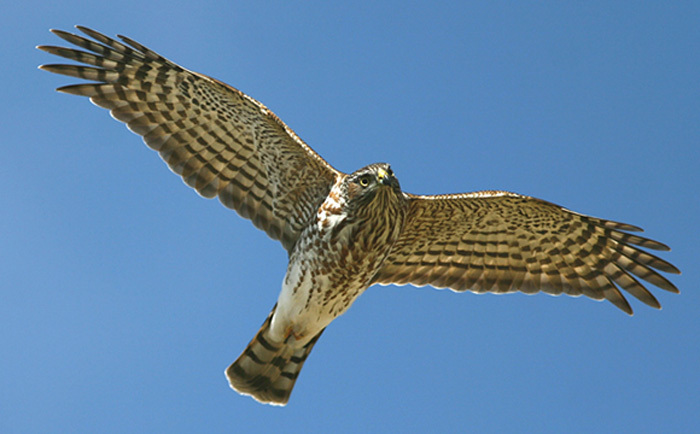 When they fly, sharpies typically make several quick wingbeats and then glide a short distance. But in spring, both males and females may engage in a territorial display known as 'slow flight.' The birds fly with slow, exaggerated wingbeats while exposing the white underside of their tail. Both sexes may give a 'kik-kik-kik' call during these flights. "The number of Sharp-shinned Hawks declined following the introduction of DDT in the mid-1940's but rebounded after DDT was banned in 1972. Today large numbers of sharpies can be observed during their fall migration. Over 11,000 were counted on one day in October at Cape May Point, New Jersey. However, we can see sharpies throughout the year." We're sorry if this seemed confusing to you. 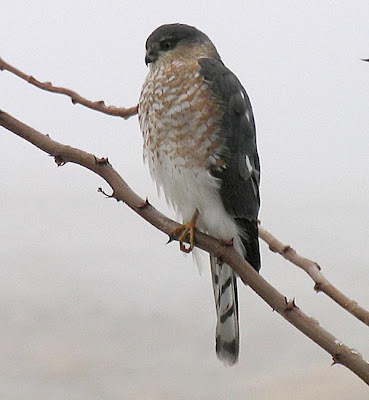 The Sharp-shinned Hawk is a hawk — not a falcon. It's the kestrel, which used to be called sparrow hawk, that is a falcon. The point is that the sharpie is our smallest hawk, but sometimes people think the kestrel is, because of the confusion about it being called sparrow hawk. It might help to look at the birds' Latin names. 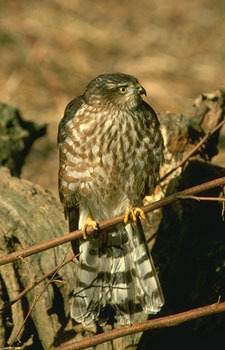 The Sharp-shinned Hawk is Accipiter striatus. 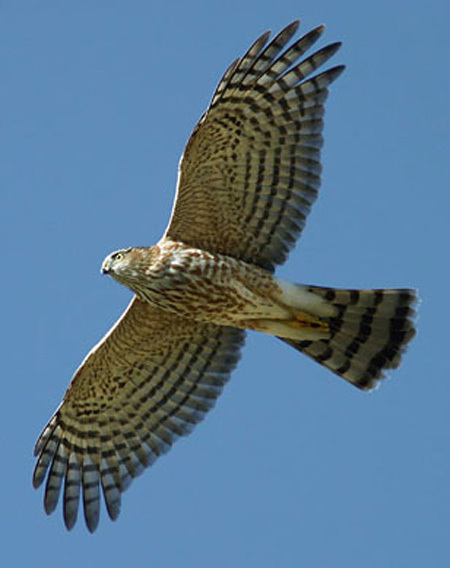 An accipiter is one of several genera of hawks found in North America. The American Kestrel's Latin name is Falco sparverius. Falco is our only genus of falcons. It's a little complicated, but it's important that you have the right information for your report. Hope this helps. Thanks for writing. thank you sooo much this website is really helpful and i was a little confused when it said that the sharpie is a falcon but i guess its not!!!!!! hahahah thank you:) now i can move on with my project:)!! We're glad to hear you're not confused anymore. Good luck with your report. thank you and can i ask you one thing? how do the sharpies get hit by cars? when are they ever near them? Although no one knows for sure, the problem sharpies have with cars is probably due to their hunting method. They tend to pursue small birds at low level, rather than diving from above like a Red-tailed Hawk or a Peregrine Falcon. Instead, sharpies sneak up on their prey by flying through undergrowth and charging it at full speed. A bird can try to flee, but sharpies are usually too fast. Open areas bordered by woods or shrubs are the best hunting grounds for sharpies. Unfortunately, this describes many roadsides and highway verges. When a sharpie uses its usual hunting tactic, its prey often flees across the road and this can bring the sharpie into contact with a car. It is unlikely that sharpies can change their hunting tactics, so this will continue to be a problem for the species. Thanks for your question. We hope this helps. Sharp-shinned Hawks really don't have any natural enemies. They compete for food with other birds of prey, especially Cooper's Hawks, but sharpies avoid this problem by staying away from them. The number of sharpies fluctuated considerably during the 20th century, but that may have been because of the wide use of the pesticide DDT, which weakens eggshells. Once DDT was banned in the 1970s, the number of sharpies rebounded. However, recently their numbers have begun to decline again, but no one knows exactly why. Hope you get an A on your report. Let us know. You're very welcome. We're glad we could help. Good luck! Hi! I was just wondering where I can find the section in this blog where it tells you how the Sharp Shinned Hawks main reason for death is. I can't seem to find it but that other person could.....I have to do a report on it to! Please, if you can, help me. Thank you! Sharp-shinned Hawks are very secretive, which makes them difficult to observe. Most of what we know about sharpies comes from watching them during migration, which means their life histories are relatively unknown. However, experts suggest that, aside from natural causes (old age, sickness, starvation due to a lack of prey), there are four possible causes of death for sharpies: 1. collisions with windows and vehicles, 2. gunshot, 3. predation and 4. pesticides. Collisions are the result of accidents or carelessness on the part of the bird. Gunshots often come from farmers who consider sharpies pests, especially when they go after the farmer's chickens. Predation is relatively rare, but possible predators include owls and other birds of prey, such as Cooper's Hawks, Northern Goshawks and Peregrine Falcons. (There is even a report of a Bald Eagle preying on a sharpie.) Pesticides have been blamed for declines in the number of sharpies in the past (DDT weakened their eggshells, but it was banned in the 1970s), but that is less of a factor today. Thanks for your question. Good luck, Jenna. Hi! Thanks for the information. I was just wondering on the 3rd reson they die, predation, what or who are they're predators? You're welcome. The information for predation is in the answer above, beginning at "Predation is relatively rare . . . " and runs up to "Pesticides have been blamed . . . ." Good luck with your report. Thanks!! I will tell you how I did. When I get my report back. You're welcome, Jenna. Good luck! Congratulations, Jenna! We're proud of you! Glad we could help.